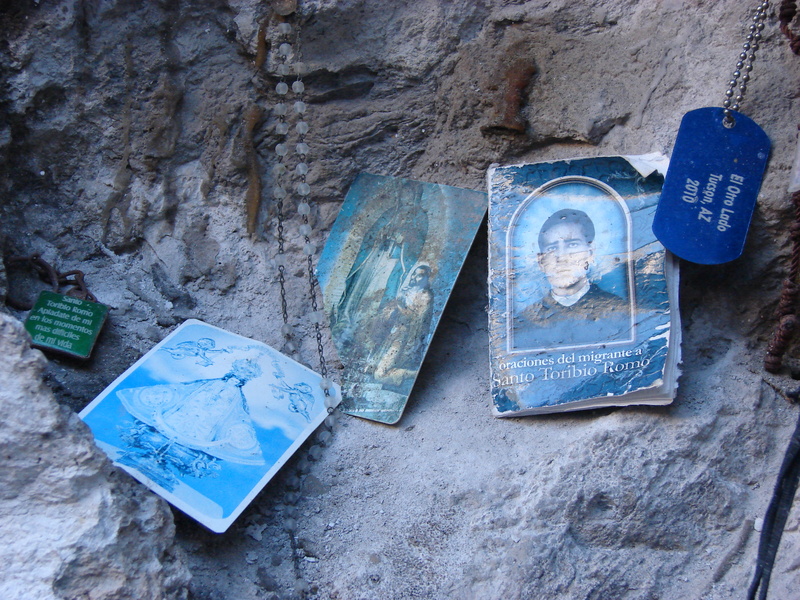 The migrants themselves, being primarily Mexican, are primarily Catholic. The migrants draw on their faith to guide and protect them on their long crossings through the desert. Despite the urgency of the journey, the risks of the desert, and the cold of the night, those that cross from there to here make the time to pray. Earlier this week I hiked one of the migrant trails with members of No More Deaths and a group of high school students. We followed our guide single file past Arivaca Lake, along the river wash, and through the thick mesquite and acacia. The pathways are ancient. Animals first trampled into the routed into existence centuries ago, then the local Native peoples used them. Now groups of migrants, led by Mexican guides called coyotes, trod northward up these paths. The stories of these migrations are told by the items they leave behind. We found battered backpacks abandoned on the ground. Empty tuna cans. Water bottles. A torn L.A. Dodgers jacket and a pair of discarded blue jeans. A crushed can of Red Bull. Coyotes give Red Bull to their clients when they start to fatigue, but the high levels of sugar and caffeine are dangerous for bodies weakened by the journey. Our own journey ended where rock walls rose on both sides of the path to form a kind of protected alcove. 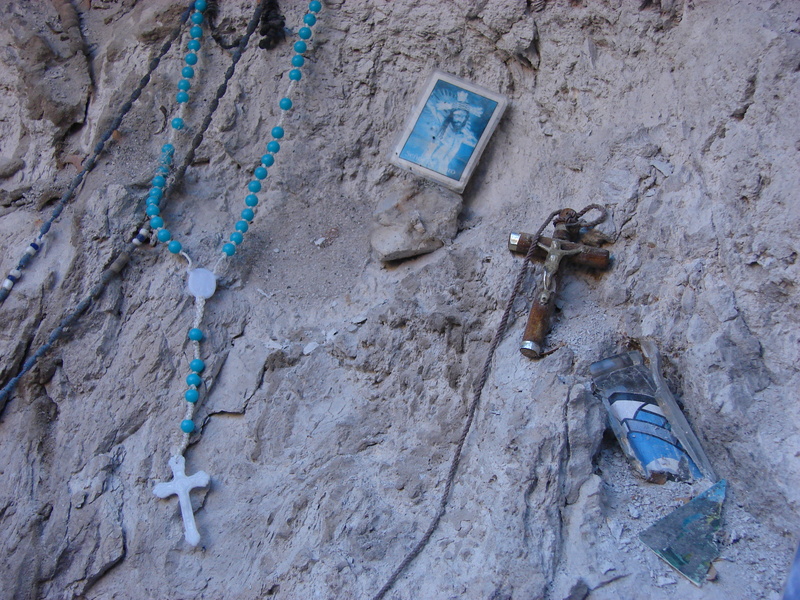 Passing migrants had transformed a natural shelf of rock into a shrine. 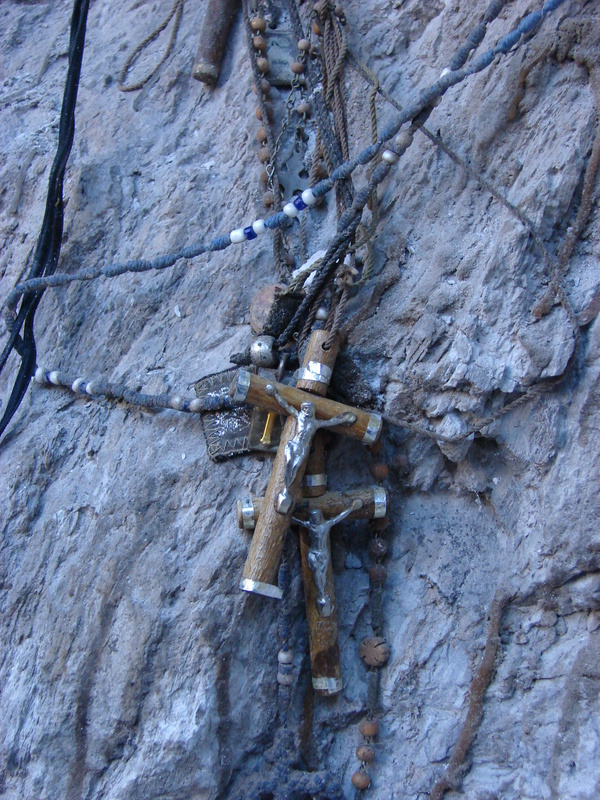 Migrants prayed here for a successful crossing. They hung rosaries and and prayer books and portraits of saints. The travelers lit candles here; broken glass votives littered the ground around the shrine. Migrants travel light. They carry everything they need on their backs. Yet they find space for candles to light during their journey. The implements of faith are as necessary as bottles of water and cans of food.